You are here: Home / Book trailer for Chalk Eagle perfectly captures a child’s imagination! Chalk Eagle was inspired by the real childhood games and memories of author/illustrator Nazli Tahvili’s husband, Amin! Watch one of our beautiful wordless picture books be brought to life with this stunning book trailer for Chalk Eagle. The gorgeous animation and dreamlike screen print illustrations by Nazli Tahvili perfectly capture the feelings of freedom and flying that are so important through the book. 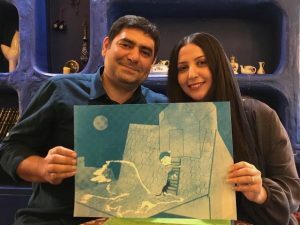 The animation is accompanied by the soothing guitar of her husband Amin, whose very own childhood imagination and memories inspired the wonderful story! Chalk Eagle shares the story of a boy living in a bustling city, who dreams of finding adventure out in the world. Seeing an eagle flying above him, he gets the idea to draw himself and his very own eagle in chalk, allowing them, through the power of imagination, to fly away together and have the adventures he had imagined and wished for. Enjoy the video and don’t forget to share your thoughts and comments with us!